Ten-Second Bio: Born in Rome and raised in Paris, Ilaria Urbinati has been a buyer for Satine and Milk, a stylist for movies, television, top magazines, and runway shows, has designed for both men and women, and now owns and operates L.A.’s beloved Confederacy boutique. Favorite ‘80s memory: "I was pretty little... So, um, moving to the United States from Paris?" Favorite GUESS memory: "I'm obsessed with all the old GUESS ads — they’ve long been inspiration for me. I reference them every chance I get, particularly the Drew Barrymore ones. 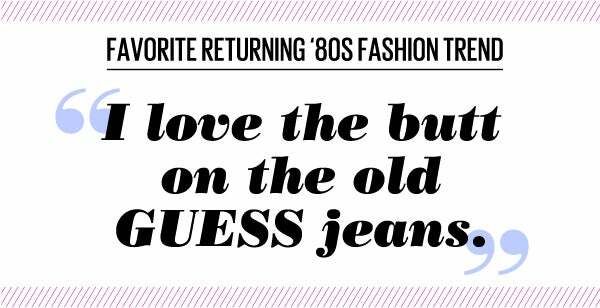 On my favorite TV show, Beverly Hills 90210, Brenda and Kelly always wore GUESS jeans. I needed a pair, but my mother wouldn't buy them for me." Claudia Corset , $98, available at Guess.